As Christmas approaches, it was announced today that Wirral Council are one of only 4 public bodies to face a three month period of ICO monitoring, commencing in January 2013. They are the only English Council to face the regime this time around. It’s happened before, but the same staff and councillors appear to have learned very little; unlike the other 18 (count them) councils mentioned at this link – who appear to have upped their game and not re-appeared on the list this time. Is this second appearance on the ‘naughty list’ another first for Wirral? Who knows? But they could begin to make a habit of it, given the convergence of their deep-seated, unchecked arrogance and the wider climate of cuts. 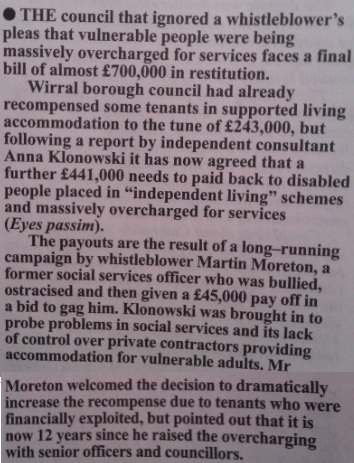 Having dealt with Wirral Council for some years, the news doesn’t surprise me one bit. Let me reassure you, they are every bit as bad as this decision to monitor implies – and probably worse. I won’t trot out all of my dismal experiences here, but here’s a link to some analysis of a few of my own requests, which will be updated in the New Year, but should give you a flavour of the inertia that the public are greeted with by default – and the level of importance this council attaches to the public’s statutory right to Freedom of Information and Data Protection. In the following article, whoever the Liverpool Echo interviewed from Wirral felt it necessary to blame the public once again by indicating that one citizen is the source of a fifth of all complaints. And yet again, there’s an inability to acknowledge that they’ve been mired in scandal upon fiasco upon further scandal since well into the last century. As I’ve said before, no organisation can grapple with a deep-seated problem such as this until self-awareness fully hits home and it stops going down the easy route of blaming other people for its own desperate, self-inflicted failures. As far as Freedom of Information is concerned, with the wider climate of cuts and job losses, and with Wirral Council’s tendency to hit out and take potshots at the public who voted them into power, I expect more of the same and for the abusive masters clutching the whip hand to thrash about and sink even deeper into the miserable foetid swamp of their own creation. Then read the following report, written up by Wirral’s “Head of IT Services”. My first observation is… Why mix in LGO complaints with FoI complaints? It’s not very helpful to conflate the two, and a muddying of the water. As far as Freedom of Information goes, much of the emphasis throughout this report seems to fall upon unnamed members of the public, who’ve had the temerity to raise a large number of requests. 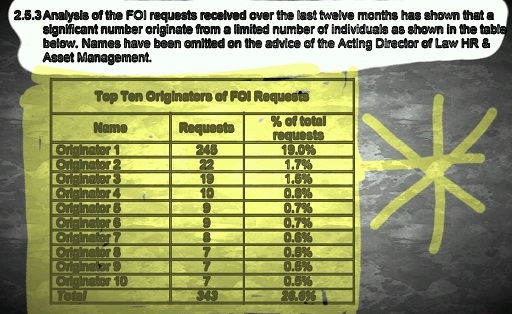 There’s a reference to a table titled, “Top Ten Originators of FOI Requests” – a kind of rogues’ gallery, which is worth reproducing here. The implication is that they resisted the urge to reproduce citizens’ names publicly in this report. That would have been both stupid & outrageous. Originator 1 has made eleven times more requests than Originator 2. I’d suggest that if, as the data controller, you’re justified in going down the road of blaming a small number of people making a large number of requests – which you certainly are not – then this is your problem person ! 1 person making 245. There’s no need for the rest of the table in fact. And who exactly decides what is excessive? Are Originators 8, 9 and 10, (making 7 requests each in a whole year) too much for Wirral Council to cope with? Do they deserve to be lumped in? Give us a break ! It’s quite clear that “Originators” 2 thru 10 are merely “padding” – having only made between 22 and 7 requests in the whole year, or a total of 98, translating to an average of just over 10 (less than one a month) between them. Can they really be part of a groundswell of ‘unseemly and pernicious FoI requesting’ breaking out all across Wirral? As rumour and innuendo seem to have been given free rein, it appears our elected councillors, the intended recipients of this report, are being urged to believe that despite the council doing its utmost, a small number of people (with an axe to grind?) …are making life very difficult for hard-pressed FoI officers (all one of them, plus an assistant). How can staff cope if the sheer volume of requests prevents them from doing their jobs effectively? It doesn’t suit the report’s author to bring everything into context and refer to any of the important statutory provisions and protections detailed within the Act. It seems to have been more convenient for him to invoke an ‘out of control public’, egged on by stories in the newspapers, then juxtapose that alongside carefully selected keywords e.g. vexatious; repeated; obsessive; harassing; causing distress; significant burden; distraction; disruption; annoyance; lacking serious purpose or value. Neither does Mr Paterson mention the fact that Wirral have dedicated only two staff to the problem ~ one data / info professsional and an admin assistant. Which kind of sums up the level of importance Wirral have attached to addressing the public’s statutory information and data querying rights. Sadly, the report’s purpose is to run, headlong, with the tactics of smear. The heavy hint to councillors is that all of these requests are somehow “vexatious”. There’s no reference to the fact that a person / requester cannot be vexatious, because the truth would be inconvenient in this case – and detract from the message. The person making 245 requests in the last year has not been challenged for placing vexatious requests – possibly because not one of those requests is repetitious, invalid or frivolous in any way and therefore cannot be refused under the Act. Well, I can’t think of any other reason not to get tough with “Mr Sheffield” ! The above list is by no means exhaustive. Wirral recently let slip the identity of another public-spirited whistleblower. It was published in full view of the world on the council’s website. Many have interpreted this as a deliberate “shot across the bows” of any principled staff members who may be contemplating blowing the whistle themselves. There are countless more scandals and fiascos, too numerous to mention. Predictably, ‘other councils’, similarly sized or not, don’t tend to boast such horrific roll-calls of corporate bullying, malpractice, attempted cover up, repeated abuse and suspected impropriety, going back well over a decade, and on into the last century. Hence, the all too understandable response from the public, a legitimate and compelling desire as concerned citizens (who hand over a great deal of money in council tax): to find out what the hell is going on. Given the above Council report, which is just the latest addition to the ongoing fiasco, the people of Wirral must be doubtful that those at the top have ever digested and fully understood the AKA report. With the situation so dire, and with vulnerable people still struggling under this basket case of a Council, self-awareness is all. Sadly, the top people appear myopic at best, blind at worst to progressive solutions – and are falling into the same old traps all over again. There’s no perceived commitment to good old-fashioned public service – despite the calling in of an LGA “improvement board” – which has already been seen to omit important issues raised by the local public from the minutes of its public meetings. I attended an improvement board meeting on 22nd June this year, went before them and lodged a clear and detailed question on accountability for people believed to have been involved in abuse. These were two former senior officers who dodged any disciplinary sanction, and were then paid off and gagged (total £220,000) within a legal document. When the minutes arrived, they’d been generalised; homogenised, with all the discomfiting points related to the clear enabling of abuse omitted. Thank you Wirral. Job done. How convenient. How self-serving; but not very open; not very transparent; not at all accountable, and certainly NOT an “improvement”. The fact we’ve had no reckoning for past abuses means they’re still locked into complete denial ~ spinning, protecting, shielding and concealing everything within a destructive vacuum – a kind of black hole that consumes all, destroys any light, and succeeds only in “churning out heat and smoke”; the intention being to protect the power, obscure the issues, and pave the way for future speculators to descend into a pit of abuse, knowing they can emerge clean, and loaded down with a stash of easy money to disappear with over the horizon when the time comes. That’s what happens with proven basket case authorities, blind to accountability. Chancers and those on the make see an opportunity – and become desperate to join in and raid the public purse – where they know there’s a good chance they’ll get away with it. This entry was posted in FoI Requests, General and tagged AKA report, Bill Norman, DASS, data controller, director of finance, Director of Law, FoI request, freedom of information, Geoff Paterson, Ian Coleman, ICO, Jim Wilkie, Martin Morton, Martin Smith report, Private Eye. Bookmark the permalink. Notice how they complain about 340 requests in the first quarter of 2012/13 (2012/12 as the report puts it) then, handily, produce a table showing how those 10 citizens have made 343. Of course, that was over twelve months, but Look! The Numbers [almost] match! Quick, don’t look too closely. No. Don’t read the details. The numbers! They’re all that matter! I have a meeting with an influential person coming up soon. The first issue I’ll raise is Wirral’s apparent inability to recognise its own failure and get to grips with it. 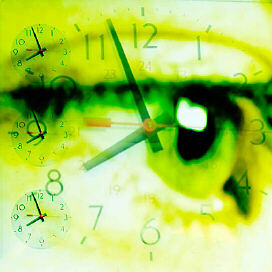 The starting point to any successful improvement of service has to be “awareness” of the problems. Well as one of the members of the council’s “hall of shame” for exercising my right to make a series of perfectly reasonable requests under the FOI I really enjoiyed this piece. Great writing. Considering that several of these requests are still outstanding and the last communication I had with the council was in April, I would love to chase them up but would hate to divert precious resources away from office refurbishments or other “exemplar” projects clearly in the public interest. A Brunswick House incident in 2010 involving an assault and for which the individual concerned requested CCTV footage using Data Protection Act rights resulted in a warning from the ICO – they accidentally lost several written requests for CCTV footage, ultimately the footage being deleted as a matter of routine. The rot is I am afraid across the whole of local government (not just council).